Rooms from $239.00 per night. Description This Denver, Colorado hotel has an indoor pool, free internet access, non-smoking guest rooms, an on-site restaurant and free breakfast. This hotel is also pet friendly. Luxe amenities superior service and an award-winning restaurant earn raves for the Ritz-Carlton Denver. The 14-story 202-room non-smoking hotel boasts the largest rooms in Denver with each luxury unit sprawled over at least 550 square feet. The elegant rooms overlook either downtown Denver or the beautiful Rockies and are decked out with flat-panel TVs iPod docks and beds with deluxe Frette linens. The bathrooms have plush robes to wrap up in after a dip in the oversized tub or enjoying a rainfall shower. Hotel guests have access to the neighboring fitness club with an indoor pool basketball court and all the accompanying workout accoutrements. There is a full-service spa on-site to help you slide into pampered luxury mode bring your pampered pet if you like. John Elway's award-winning restaurant is here and has the Hall-of-Famer's favorites served up in a chic and comfy atmosphere; of course there's 24-hour room service. When work calls use the full business center and available Wi-Fi. Valet parking is available for an additional fee. 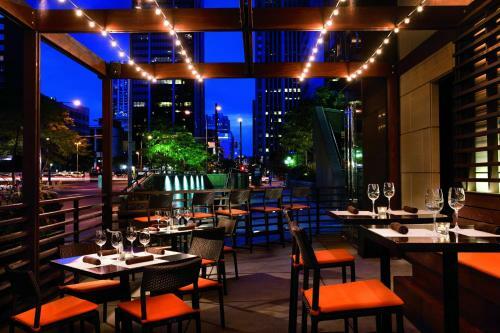 The Ritz-Carlton is located in the heart of downtown Denver with many attractions within easy walking distance. The Sixteenth Street pedestrian mall is just two blocks away as is charming Larimer Square GÇö a great place for dining entertainment and people-watching. The Colorado Convention Center is less than one mile away and Denver International Airport is a 26-mile drive. The hotel offers valet parking only but with Denver's excellent transportation links you could skip the car. Add The Ritz-carlton Denver to your free online travel itinerary.